UMPC Link-up via Twitter g_rouping. In 1988 I started using Usenet news. it was a great way to communicate with like-minded people and really didn’t require much effort. Unfortunately, the bandwidth requirements for the millions of images and iso’s quickly exceeded what most ISP’s could handle and many dropped the system. Since then I’ve been involved with ICQ and about every other messaging system out there but never have I used a system that connected me with so many people in such a simple way as I have since I started using Twitter. I’ve been using it mainly for business purposes and have been keeping my ‘tweets’ as focused as possible and now that I’ve reached 600 followers, the whole Twitter ecosystem including the Twitter website, the search facility and the 3rd-party apps have become so important that the system is one of my primary communication channels. Twitter is not without it’s issues though and one of the main problems is that it’s difficult to find or create a community around a theme or subject. It’s difficult to find and track like-minded people and to mesh with them to create a benefit for everyone so this morning, while I was in the shower, I had an idea which I want to promote here. I’ve called it Twitter g_rouping and it’s simple. 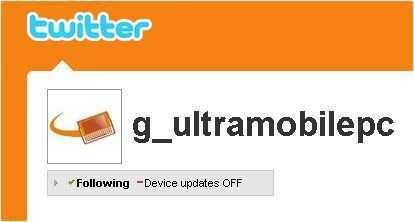 I’ve created a new Twitter user called g_ultramobilepc and all you need to do to connect with like-minded people is to follow that user. I’ll follow back (and filter the bots and spam accounts) and you’ll then have access to, via the g_ultramobilepc user, a great list of people that you can follow too. Create a huge mesh of fans around any topic and reap the obvious benefits from sharing and discussing topics in near real-time. All conversations get recorded in Twitter and become searchable with third-party services adding even more value. If you connect with someone that connects back you also complete a private ‘direct message’ path too. You can find more information on the idea at http://simpletwittergroups.blogspot.com/ and I encourage you to re-blog this, retweet this is you think it’s good. If not, tell me why. I’m ‘chippy’ on Twitter and stay mainly focused on mobile computing and social networking so in addition to g_ultramobilepc, make sure you connect with me too so I can learn more about you and follow your thoughts.